If you’ve created a data connection that you might want to use with other workbooks or share with colleagues, you can export (save) the data source to a file. You might want to do this also if you’ve added joined tables, default properties, or custom fields—such as groups, sets, calculated fields, and binned fields—to the Data pane. Note: This topic describes how to save a data source that you reuse locally, if you do not publish to Tableau Server or Tableau Online. For information about sharing data sources on a server, see Publish Data Sources and Workbooks. 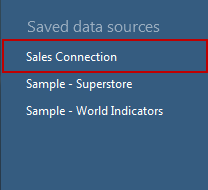 In Tableau Desktop, open the workbook that has the connection to the data you want to save as a file. At the top of the Data pane, right-click (Control-click on Mac) the name of the data source, and then select Add to Saved Data Sources. Enter a file name, select the file type (.tds or .tdsx), and then click Save. By default, Tableau saves .tds and .tdsx files to the Datasources folder under your Tableau repository. When you use the default location, you can connect to the data source on the Connect pane. If you specified a different location, you can connect to the data source by selecting File > Open and navigating to it. If you move a local data file that a .tds file contains a reference to, when you try to open the data source in Tableau, you will be prompted to locate or replace the original data source. If you replace the original data source, the replacement data must be of the same type (for example, Excel or MySQL). To avoid saving a specific file path, save the data source as a .tdsx file.